"Good Fences Make Good Neighbors", Ai Weiwei's ambitious, multi-borough exhibition opens in October 2017 as the culmination of the celebration of the Public Art Fund's 40th Anniversary year. Inspired by the international migration crisis and current global geopolitical landscape, the exhibition will transform the security fence into a powerful social and artistic symbol with interventions across the city. The 300+ locations will open on 12 October, and is the artist's largest public art project to date. Large-scale, site-specific, freestanding works will be installed around the city in sites such as Washington Square Park, Central Park, Flushing Meadows-Corona Park and others. In addition to these sculptural works, the artist has created a new series of 200 two-dimensional works that will appear in all five boroughs on lamppost banners, as well as a new series of 100+ documentary images to be installed citywide on bus shelters and newsstands. The photos were taken by Ai Weiwei during his travels and ongoing research on the global refugee crisis and will be paired with poetic and factual texts to connect the very real stories of displaced people from around the world to the artist's symbolic interventions throughout New York City. You can be a part of Ai Weiwei's revolutionary work by joining a community of artists, activists and citizens standing up against the forces that separate us. Donate via Kickstarter here. 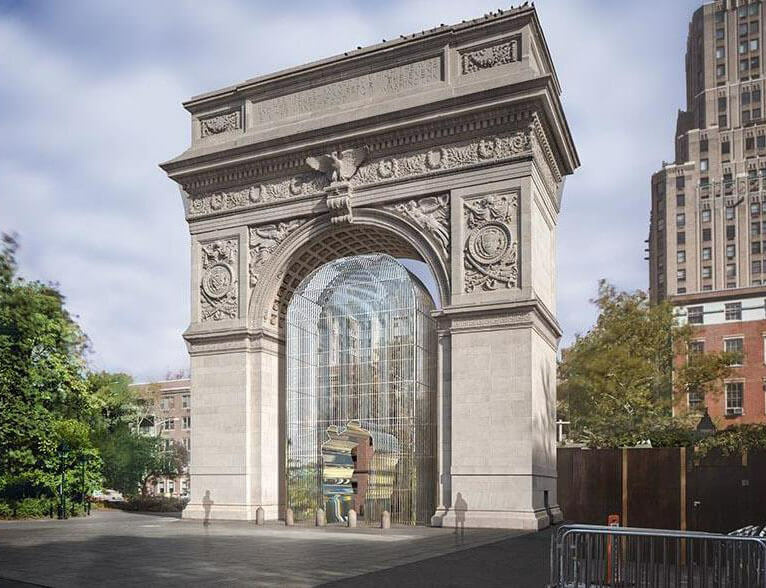 Image: Rendering of one piece in the multi-part Public Art Fund project "Ai Weiwei: Good Fences Make Good Neighbors" at Washington Square Park, courtesy of Ai Weiwei Studio/ Frahm & Frahm.